Thank you for visiting my website. 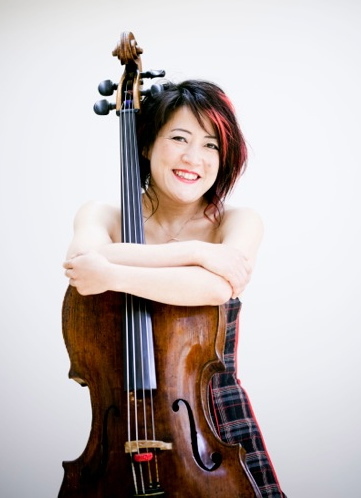 My name is Su-a Lee and I am Assistant Principal Cellist with the Scottish Chamber Orchestra and a founding member of Mr McFalls Chamber. My music has taken me all over the world, from South America to the Arctic Circle, Japanese temples, circus tents and waterfalls! Appointed Assistant Principal Cellist in 2003, I have been a member of the Scottish Chamber Orchestra since 1993. I am also active in the experimental SCO Lab group and regularly participates in both the Orchestra’s education and community outreach programmes. In 2009, the SCO made an extensive tour of India, where the Lab group played as soloists alongside the Sarod Maestro, Ustad Amjad Ali Khan. A CD of our collaboration Samaagam was released in May 2011. Though I spend most of my time playing classical music, I also play across all art forms and a wide musical spectrum. I have played for Theatre, Dance and Film and perform and record regularly with Scotland’s Jazz and Folk luminaries and I am also Chief Patron of the Perth Youth Orchestra. In 2009 I further explored the territory of improvised music, collaborating with painter Alan Kilpatrick to perform an improvised live installation piece at the Flemming Gallery in London. In January 2012, I got to perform with former Cream bass player, Jack Bruce, with Mr McFall's Chamber at Celtic Connections. Between April and October 2015, I am taking a 6 month sabbatical from the SCO to take on an ambitious project of learning from a wide variety of global musical cultures. This will involve taking part in Yo Yo Ma’s Silk Road Ensemble’s Global Musicians Workshop, as well as an intensive 3 weeks of masterclasses and chamber music with Steven Doane from the Eastman School. I will also be taking part in some string camps for traditional music, whether celtic, bluegrass or something in between! And if that isn’t enough, I am attending an Arabic Music retreat where I will immerse myself in the different tones and instruments of the Middle East. Not to mention learning baroque cello with Alison MacGillivray and Anner Bylsma. I am very grateful to Creative Scotland, the Hope Scott Trust and the Scottish Chamber Orchestra for making this all possible for me.